The biggest names in data centers and clouds are now vying to dominate the emerging IT battleground in factories, vehicles and power plants. The so-called industrial Internet of Things calls for data-gathering and analysis at the edge of enterprise networks, where conventional systems wouldn’t be efficient or hardy enough. IT stalwarts like HPE, IBM and Dell say they can now meet those requirements. The challenge is to make sense of large amounts of data pouring in from sensors on industrial equipment and act on what the data reveals. It may alert companies to immediate problems or give long-term insights into how things are working. For example, IoT can tell enterprises when parts are getting worn down so they can replace them before systems fail. On Wednesday, Hewlett Packard Enterprise made its latest bid for this space with what it calls the first converged systems for IoT. The Edgeline EL1000 and EL4000 are Intel Xeon-based systems with computing, storage and data-capture features built in. They flesh out a line of products launched late last year. The systems take full-fledged data-center power to the edge of the network in hardware that can be mounted on things like windmills and rail cars, HPE said. The unveiling at the company’s Discover conference in Las Vegas came just a week after rival Cisco Systems teamed up with IBM for its latest edge effort. The company announced that IBM Watson analytics will now run on Cisco routers, switches and servers. Dell also has a line of edge computing systems. HPE claims its converged systems are superior because they let enterprises keep more functions at the edge, where they’re needed most. That’s important when quick decisions are needed and there’s no time to send the data to the cloud. Rather than just sift through incoming data and send the most important information to the cloud, these systems can do most of the deep analytics right at the edge, said Tom Bradicich, vice president and general manager of servers and IoT systems. They can also plug in to clouds and private data centers for customers who want to use those. The EL4000, the larger of HPE’s two new systems, can be configured with as many as 64 Xeon cores and integrated GPUs. That’s a class above the computing power of switches and routers, Bradicich said. HP’s systems also give enterprises more ways to customize edge computing, with x86 chips for third-party applications and PCI Express interfaces for adding third-party hardware cards. Flowserve, a maker of flow management products like pumps and valves, will integrate the Edgeline systems with some of its products, said Eric van Gemeren, Flowserve’s vice president of R&D. Flowserve’s customers need to do a lot of analytics at the edge because they have too much data to send to the cloud, van Gemeren said. For example, one pump sensor can take a measurement 50 times per second, van Gemeren said. There may be six of those sensors on one pump, and 5,000 such pumps in an oil refinery. Also, a failure on site can cut off a facility’s network connection at a time when data analytics is needed most, he said. As capable as HPE’s edge systems may be, they’ll have to fit into larger industrial platforms built for the needs of specific customers. 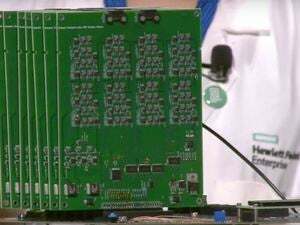 Like its rivals, HPE is lining up partners to develop these. They include GE Digital, National Instruments and PTC.